Just the name, "Striker", screams "1980s speed metal or thrash". A modern band, Striker nevertheless lives up to that assumption, mixing in more mainstream-but-legit 80s rock influences with speed and thrash metal in places on their latest LP, Stand in the Fire. Like a heavier cousin of the albums of Brother Firetribe, this one seems finely calculated to become a contender for the charts, as long as the band can find a time machine and dial it back about thirty years. And yet. Striker, like all younger-generation speed metal bands, has the benefit of hindsight, a hindsight that reveals that 80s speed metal bands, while numerous and enthusiastic in their heyday, were in many cases not particularly good. There is thus a sophisticated polish to most of the songs that Striker's influences wouldn't have had the patience or technology for, and it's not a polish that negatively affects the songs through overproduction -- more like the kind of thoughtfulness that would put a saxophone on one of the tracks (which they do) instead of making it all strictly a guitar album. The result is like a remastered version of some obscure heavy metal band that would have made it big but for that one thing, whatever it was, that cult metal album aficionados mourn to this day. The guitar distortion is a throaty overdrive with a hint of a snarl punctuated by some glorious harmonic squeals, and the songwriting ranges from mid-tempo LA-style rockers like Too Late to the thrashier Better Times (it even includes a shouted chorus line). To lead this effort we have vocalist Dan Cleary, who comfortably ranges between crooning on the quieter portions -- and there are quieter portions, as one of the practices the band has brought from the 80s is that of combining soft vocals with some clean guitar and bass verses before the heavy part starts -- and the high-pitched screams that any band from this era ought to have. They also have the other critical component of 80s metal, the reverb; it's on the guitar, it clings to the drums a bit, it hangs off the gang choruses. And it sounds absolutely fantastic on the fast-chugging title track or Escape From Shred City, an instrumental which (true to its name) consists of solid guitar shredding. Stand in the Fire's biggest drawback to some listeners may be the willingness of the band to soften their music. 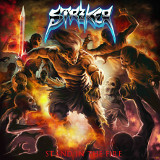 Unlike some of the speed metal bands I reviewed last year, Striker doesn't seem to need to be faster, heavier, or harder than anyone else, and they're perfectly comfortable playing 80s-style mid-tempo ballad choruses right after the heavier, faster verses. But it makes for better and more melodic songs, and means that they can turn out a mid-tempo piece like United, one of my favorites, and take their time on it, solos, running bassline, and all, without having to do everything at once. Anyone who has fond memories of the melodic metal of the 80s before hair metal took over MTV is certain to like this one. And if you don't, but have a relative who was in his or her teens or twenties in the 1980s and into rock -- grab it anyway. You can at least have fun playing it and watching the person rack their brains trying to remember what band made this.